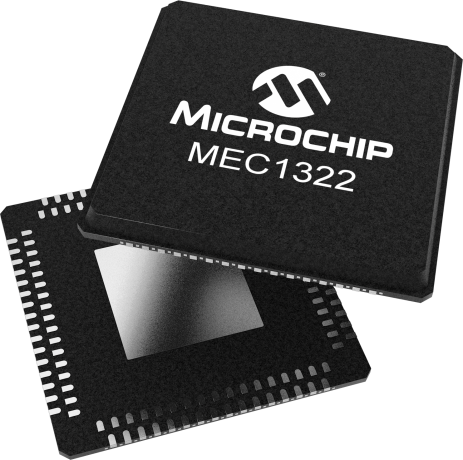 The MEC1322 incorporates a high-performance 32-bit embedded microcontroller with 128 Kilobytes of SRAM and 32 Kilobytes of Boot ROM which communicates with the system host using the Intel® Low Pin Count (LPC) bus. The product has two Serial Peripheral Interface (SPI) memory interfaces that allow the Embedded Controller (EC) to read its code from external SPI flash memory: private SPI and/or shared SPI. The Shared SPI interface allows for Embedded Controller code to be stored in a shared SPI chip along with the system BIOS. It provides support for loading EC code from the private or shared SPI flash device on a VCC1 power-on. The MEC1322 is directly powered by two separates suspend supply planes (VBAT and VCC1) and senses the runtime power plane (VCC) to provide “Instant On” and system power management functions.